Supported by a delegation of members at a special meeting with leading British politicians, the Freight Transport Association (FTA) reiterated its call for an Irish Border solution which protects frictionless trading arrangements post-Brexit. Following the meeting at Stormont over the weekend with Secretary of State for Exiting the EU David Davis MP, Secretary of State for Business Greg Clark MP and Secretary of State for Northern Ireland Karen Bradley MP, the FTA’s Northern Ireland Policy Manager Seamus Leheny stressed that the Association’s members need trade to continue to flow freely across the Border, without delays, to ensure that business can be supported on both sides of the Border. 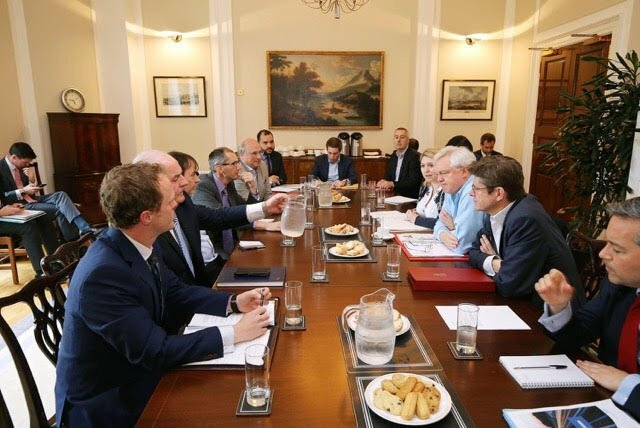 During the visit, the MPs discussed their proposed “maximum facilitation” solution to the Irish Border with Mr. Leheny and other business representatives and considered ways in which the constitutional and economic integrity of the UK could be upheld, while reinforcing commitments made to the people of Northern Ireland. With Brexit, new technology and other disruptive forces driving change in the way goods move across borders and through the supply chain, logistics has never been more important. Also present at the meeting were the following FTA member companies: Woodside Haulage – Ballyclare; Surefreight – Newry; WS Dennison – Antrim & BP McKeefry – Maghera.